Welcome to Jim's Pro Shop! 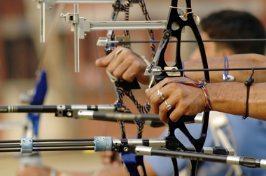 Jim's Pro Shop is upstate New York's premiere archery center featuring state-of-the-art shooting ranges, professional instruction and a full service archery shop. Whether you're a beginner or a serious shooter, a target or a 3D shooter, or just want to hone your skills for the hunting season, we offer a shooting league for you. Leagues are constantly forming at Jim's Pro Shop. Call to join one today.